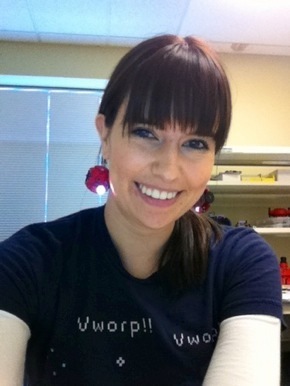 SPECIAL GUEST- Jessica Uelmen, Engineering Manager from Parallax on ASK AN ENGINEER! « Adafruit Industries – Makers, hackers, artists, designers and engineers! SPECIAL GUEST- Jessica Uelmen, Engineering Manager from Parallax on ASK AN ENGINEER! TONIGHT we have a SPECIAL GUEST- Jessica Uelmen, Engineering Manager from Parallax on ASK AN ENGINEER! – April 7th, 10pm ET! Jessica Uelmen got her start at Parallax in 2009 in the Education department training teachers how to use microcontrollers and robotics in the classroom. She also made captivating educational videos In 2011 Jessica was acknowledged for the outstanding videos and Parallax was awarded a Makey by MAKE Magazine for Best Educational/Outreach Program. Today Jessica oversees the Engineering team and manages new products from concept through production, ensuring they are cohesively designed to provide our customers with the best Parallax has to offer. Jessica’s background includes a degree in Electrical Engineering Technology with a Computer Systems specialty from the University of Central Florida. When asked why she chose to work in electronics she responded, “Because almost anything is possible! You can easily make useful contraptions to solve everyday problems, which is so much more rewarding than simply buying stuff from a large retailer.” Jessica incorporates her love of electronics by creating her own e-textiles, adding lighting and electronics to clothing. In her time outside the office Jessica is working on a Master of Engineering degree in professional practice through the University of Wisconsin. She also enjoys skiing, biking, and playing video games. In addition to being an avid Doctor Who fan, Jessica is also our resident Harry Potter expert. Comments Off on SPECIAL GUEST- Jessica Uelmen, Engineering Manager from Parallax on ASK AN ENGINEER!